A Sound Pack developed specifically for the VW Golf 7: the system’s pulsing heart is the Audison AP8.9 bit amplifier featuring bit Drive technology, combined with a dedicated Prima speaker system and accessories for real OEM integration! 2 way system featuring the Audison AP 6.5 Ω2 woofers, OEM Tweeters and a specific crossover. The system is packaged with composite OEM speaker baffles, harnesses and seals to retrofit the woofer and tweeter into speaker factory locations to an OEM standard. 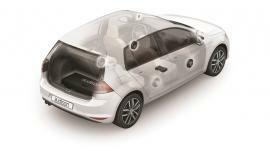 The Plug&Sound reflex passive subwoofer system integrates perfectly into the car’s interior. The subwoofer itself has been engineered to mate perfectly with the available enclosure volume, exploiting all the power the AP8.9 bit delivers. The APBX G7 subwoofer is available also as separate component.